Egyptian singer and composer Shereen Abdo expressed satisfaction with her eye-catching performance at the women music event held on Friday at the Greek Campus of the American University in Cairo on Friday, which was part of the ongoing Downtown Contemporary Arts Festival (D-CAF). 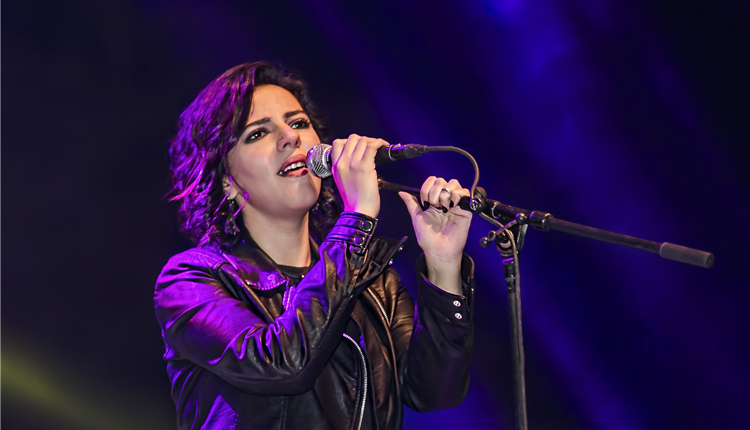 “This concert was very important to me because it was my first ever at D-CAF, such an important event that really helps the whole scene either in music, cinema, theatre or visual arts during the ongoing circumstances, which are seeing a lack of funds and shut down of many festivals,” the young independent musician told Ahram Online Monday. Abdo sang some of her own material like Akher Leila Fe December and Bokra, in addition to some jazzy arrangements of folk songs like Betghanny Li-Meen, El-Leil El-Hady and Aho Da Elly Sar, which had the crowd singing along. Abdo’s gig was the second of four different acts, which started with Maram, followed by Abdo and American folk girl-band T-Sisters, and finally Egyptian-Canadian metal band Massive Scar Era. Abdo was featured during the T-Sisters act, singing two traditional American songs with them. They also shot a video clip at the Egyptian Museum for a third song; Black Orpheus, adapted by Fairouz as Shou Bkhaf. The clip will be released soon. “The collaboration with T-Sisters came after recommendations from D-CAF and the American embassy with which I participate in the OneBeat programme ealier. We [and T-Sisters] were collaborating through the internet and agreed on what to perform before they came, and we held a workshop together for a few days. Formed in 2008, T-Sisters merges the voices of the three sister Chloe (percussion), Erika (guitar), and Rachel (guitar/banjo) and they are all songwriters in their own right and switch on lead vocals. “It was a nice opportunity to work with T-Sisters. We both have similar interests, especially in reviving folk. I perform Egyptian folk and they cover America’s, so the interaction was really important,” Abdo said. Abdo has also revealed some future plans to Ahram Online, including a video clip she is really excited about. “A very important video for a cover song will be released after Ramadan. I am looking forward to it since it will be a turning point for me that will enable me reach a wider crowd. She is expected to perform more frequently soon, and has revealed that she’s received many offers for concerts during Ramadan. Abdo, who considers herself a self-taught musician and has also worked in media and music management, has previously collaborated with some internationally recognised musicians such as Ziad Rahbani, Fathy Salama and Sheikh Zein Mahmoud. She was chosen by Rahbani to share his summer tours for two years in Lebanon’s ‘A’yad Beirut’ as the first Egyptian singer to join him and sing freshly produced songs by Rahbani in addition to Fairuz’s classics. She has worked with music styles as varied as folk, electronic, jazz, progressive rock and metal. She was a finalist in Rolling Stone Middle East’s ‘Street to Stage’ competition. She was also chosen by the distinguished US international music programme OneBeat among 25 musicians from all over the world. Shereen writes as a freelance music critic for international newspapers and websites such as AsSafir, Alaraby Algedid,Vice Arabia, 7iber, and Alakhbar alLubnaniyah.